Napoleon Bonaparte was a famous Leader from France, who lived between August 15, 1769 and May 5, 1821. He became 51 years old. 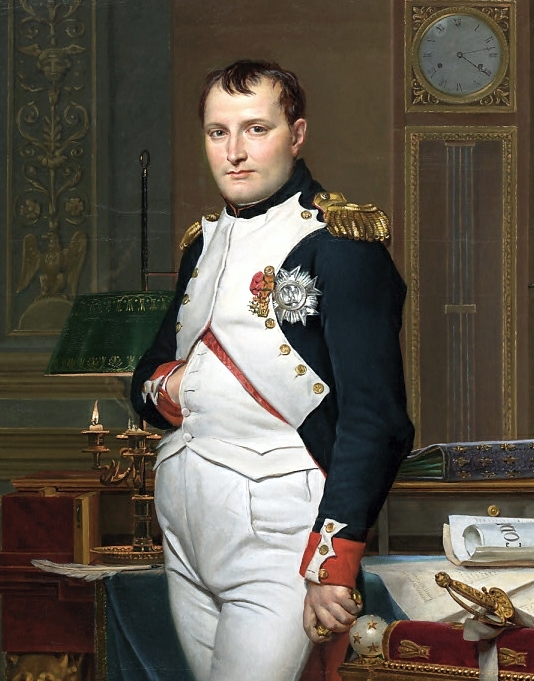 Napoléon Bonaparte (born in Ajaccio on Corsica in France, died at St. Helena) was the French emperor under the name Napoleon I from 18 May 1804 to 6 april 1814. As commander of the French military conquered and ruled him throughout most of western and central Europe, and had a couple of years also Egypt. An unsuccessful campaign in Russia, weakened his position and let the performances of the final defeat at Waterloo in 1815 that resulted in his fall. Few people in history have been discussed and researched more than Napoléon. His historical importance is still controversial, the different view of him often caused debate and disagreement. In France, he is regarded by many as a national hero. He emphasized first and foremost as an able commander in the field and military strategist, others see him more as a politician and social reformer. Of the other he is considered a great despot, tyrant or usurper. He is born under the zodiac leo, who is known for Ruling, Warmth, Generosity, Faithful, Initiative. Our collection contains 83 quotes who is written / told by Napoleon, under the main topics: Sports, Art, History, Imagination, Medical. "A Constitution should be short and obscure"
"There is no such thing as accident; it is fate misnamed"
"There are only two forces that unite men - fear and interest"
"There are only two forces in the world, the sword and the spirit. In the long run the sword will always be conquered by the spirit"
"A celebrated people lose dignity upon a closer view"
"You must not fight too often with one enemy, or you will teach him all your art of war"
"You must not fear death, my lads; defy him, and you drive him into the enemy's ranks"
"Women are nothing but machines for producing children"
"With audacity one can undertake anything, but not do everything"
"A man cannot become an atheist merely by wishing it"
"The torment of precautions often exceeds the dangers to be avoided. It is sometimes better to abandon one's self to destiny"
"The surest way to remain poor is to be an honest man"
"The strong man is the one who is able to intercept at will the communication between the senses and the mind"
"The people to fear are not those who disagree with you, but those who disagree with you and are too cowardly to let you know"
"The army is the true nobility of our country"
"The act of policing is, in order to punish less often, to punish more severely"
"Ten people who speak make more noise than ten thousand who are silent"
"Take time to deliberate, but when the time for action has arrived, stop thinking and go in"
"Soldiers generally win battles; generals get credit for them"
"Skepticism is a virtue in history as well as in philosophy"
"We must laugh at man to avoid crying for him"
"One must change one's tactics every ten years if one wishes to maintain one's superiority"
"When small men attempt great enterprises, they always end by reducing them to the level of their mediocrity"
"The herd seek out the great, not for their sake but for their influence; and the great welcome them out of vanity or need"
"One should never forbid what one lacks the power to prevent"
"If they want peace, nations should avoid the pin-pricks that precede cannon shots"
"Men are moved by two levers only: fear and self interest"
"If I had to choose a religion, the sun as the universal giver of life would be my god"
"I love power. But it is as an artist that I love it. I love it as a musician loves his violin, to draw out its sounds and chords and harmonies"
"I have only one counsel for you - be master"
"The first virtue in a soldier is endurance of fatigue; courage is only the second virtue"
"The best way to keep one's word is not to give it"
"I can no longer obey; I have tasted command, and I cannot give it up"
"Power is my mistress. I have worked too hard at her conquest to allow anyone to take her away from me"
"Never ascribe to malice that which is adequately explained by incompetence"
"Riches do not consist in the possession of treasures, but in the use made of them"
"Religion is excellent stuff for keeping common people quiet"
"Men are more easily governed through their vices than through their virtues"
"Medicines are only fit for old people"
"Let the path be open to talent"
"It requires more courage to suffer than to die"
"It is the cause, not the death, that makes the martyr"
"In politics... never retreat, never retract... never admit a mistake"
"In order to govern, the question is not to follow out a more or less valid theory but to build with whatever materials are at hand. The inevitable must be accepted and turned to advantage"
"Impossible is a word to be found only in the dictionary of fools"
"History is the version of past events that people have decided to agree upon"
"He who knows how to flatter also knows how to slander"
"He who fears being conquered is sure of defeat"
"Great ambition is the passion of a great character. Those endowed with it may perform very good or very bad acts. All depends on the principles which direct them"
"From the heights of these pyramids, forty centuries look down on us"
"France has more need of me than I have need of France"
"Forethought we may have, undoubtedly, but not foresight"
"England is a nation of shopkeepers"
"Doctors will have more lives to answer for in the next world than even we generals"
"Courage is like love; it must have hope for nourishment"
"An army marches on its stomach"
"Among those who dislike oppression are many who like to oppress"
"Ambition never is in a greater hurry that I; it merely keeps pace with circumstances and with my general way of thinking"
"All religions have been made by men"
"Ability is nothing without opportunity"
"A true man hates no one"
"A throne is only a bench covered with velvet"
"A soldier will fight long and hard for a bit of colored ribbon"
"A revolution can be neither made nor stopped. The only thing that can be done is for one of several of its children to give it a direction by dint of victories"